UNARCO Interchangeable Teardrop Pallet Racks | T.P. Supply Co. If you need storage, you need a practical, simple solution. You also need your product to be durable so that your investment will be cost-wise. At T.P. Supply Co, Inc., we pride ourselves on providing our customers with the best storage and material-handling options available. As a retailer of UNARCO products, we are proud to offer UNARCO pallet racking systems to handle all of your needs. Selecting the proper pallet racking system can be a difficult decision for some businesses, as it's a long-term investment that has a significant impact on your company's future. If you need reliable racks you can alter with new parts and accessories whenever you need them, count on T.P. Supply Co. We can provide you with one of many different options available from UNARCO, which has been one of the nation's top manufacturers for more than 60 years. We don't produce our pallet racks, but we'll handle every other part of the process. From sales service to delivery to installation, you're sure to find a dedicated partner in us. T.P. 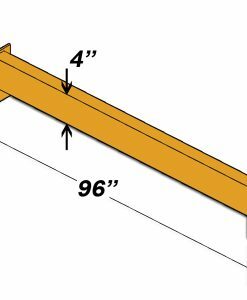 Supply Co. provides interchangeable beams and uprights you can use for a variety of applications. 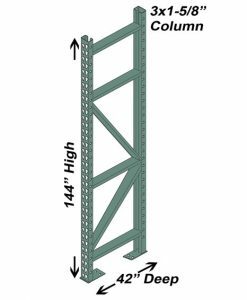 The UNARCO pallet racks for sale in our collection are heavy duty, so you can count on your shelving to hold up, even under the stress of supporting industrial and manufacturing equipment and supplies. Why Choose UNARCO Pallet Racks? Your business should be able to maintain the versatility to adapt to any growths or shrinkages in your inventory, and UNARCO interchangeable pallet racks allow you to do just that. Having proper storage space not only reduces distribution costs, but it can also increase the efficiency of your workflow while minimizing the potential for employee injuries. With systems that range from 96 to 240 inches tall and 36 to 48 inches deep, you can comfortably store all your merchandise without needing to stack pallets on top of each other. The system also allows for easy locating and subsequent transportation, which means you can move merchandise quicker. Eliminating pallet stacking also increases the safety of your building, as UNARCO racks all include a strong lock system to keep them upright. Proper storage also means avoiding damaged goods, which can negatively impact your overheard. Not only do you have different pallet racks to choose from, but we also supply different conditions of systems to fit your budget requirements. Select from new, used and reconditioned, all of which are certified by major governing bodies and vary in cost. All pallet racks from UNARCO are compliant with the latest guidelines put forth by the RMI and ANSI. Interchangeable Rack: Offering the epitome of flexibility, UNARCO's interchangeable uprights and beams can adapt to most other teardrop designs. The system features tapered, teardrop-shaped hole punches on 2-inch centers along the front of the uprights. With the company's patented Gravity Lock system and other spring lock designs, your racks will be securely held up while still allowing for future reconfiguration. T-Bolt Rack: Distinguishable by the ease of use, rigidity and overall strength, UNARCO's T-Bolt racks offer a front-end-only connection that makes installation quick and smooth. As opposed to other systems, the T-Bolt does not require installers to reach inside the column. The head of the bolt inserts through the beam connector and column, and installers then fasten it with one quarter-turn. The extra rigidity of T-Bolts will grant greater elevation consistency and tighter tolerances through the rack structure, which helps to ensure long-term durability. UNARCO's modernized equipment features automatic and robotic welding, with work done by AWS-certified welders. This process helps to ensure that every system adheres to industry standards. For decades, T.P. Supply Co, Inc., has provided exceptional service and durable products with a 90 percent rate for attracting repeat business. We’re dedicated to our clients, which is why they come back again and again — they appreciate our expertise and commitment to providing the best products we can get. We've grown from a small business operating in Mount Airy, N.C., to a thriving distributor that serves companies throughout the United States, Canada and Mexico. We take pride in handling everything outside of production in-house. We deliver using our own trucks, and our employees take care of installation. To learn more about T.P. Supply Co, Inc., our products, or our services, contact us online or give us a call toll-free at (877) 302-2337. For bulk savings, ask about our bulk order pricing. We hope to assist you soon.